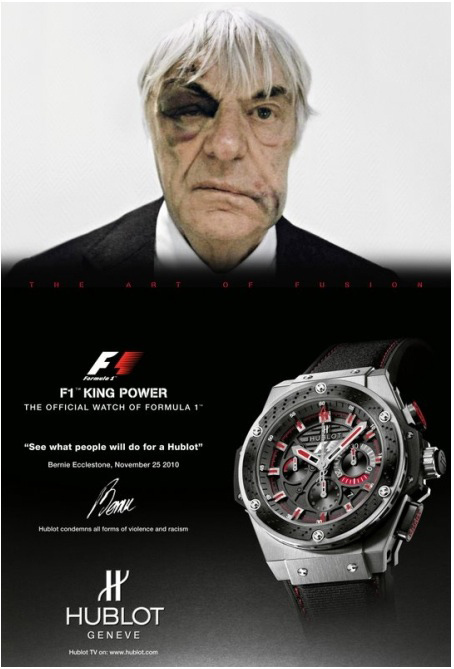 The brand Hublot didn’t really need to do this but it did and in my opinion, it was in poor taste – They featured a bruised mugshot of Bernie Ecclestone, the Formula one boss in their recent advertisement. He got the bruises while being robbed last month along with his girlfriend. The attackers stole his watch and a month later, he pedalled his mug for Hublot with a quote attributed to him – “See what people will do for a Hublot”. The whole thing could’ve been staged as a marketing scheme. Who knows these days… Hublot makes nice watches though. I think that was not a great advert for the brand. Besides being a horrible ad, I hope I am not hurting anyone feelings, but I believe they have more positive examples to give.